Have you found nothing available? Check by contacting us directly by telephone or email. Contact us on +33(0)4 75 88 31 97. With the leading designated Lawn Bowls bowling green in France, the Domaine Les Ranchisses campsite offers you the chance to discover this sport, of English origin, during your stay with us. Lawn bowls, also known by the name of boulingrin in France, is a sport that requires tactics and skill, which is particularly played within a convivial setting and with good humour! To a very large extent played in Commonwealth member countries, lawn bowls is a sport the aim of which is to roll more bowls than your opponent as close as possible to the jack. This sport, which bears no relation to pétanque, or the French Boule Lyonnaise (sport boules), is played on a lawn known as a bowling green. Allow yourself to be enchanted by this “so British” sport, and experience a delightful moment during your stay at the Domaine Les Ranchisses campsite! Designated a “Bowls Social Club” by the Fédération Française de Lawn Bowls (French Lawn Bowls Federation – “FFLB”), our establishment has the leading regulation-size bowling green in France, completely dedicated to playing this sport. Don’t delay therefore in making the most of this leisure facility, unique of its kind in the Ardèche! Lawn Bowls is a sport which has certain similarities to pétanque or boule lyonnaise. However, it is also set apart from them by numerous details, in particular by the shape of the bowls and the green upon which it is played. Lawn Bowls has been played in England since the 17th century, and has subsequently spread to various Commonwealth countries. Now widely played in these countries, it is in France that a Fédération Française de Lawn Bowls (French Lawn Bowls Federation) was formed. This group’s ambition is to spread the influence of this sport throughout France. 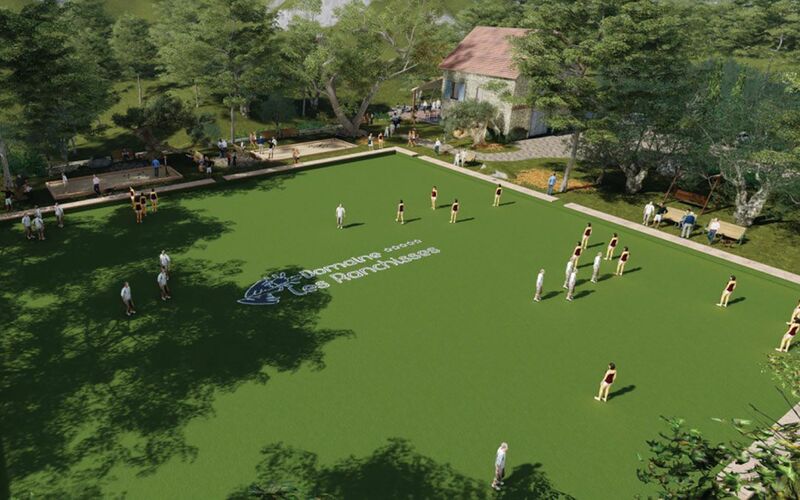 The Lawn Bowls green at the Domaine Les Ranchisses falls entirely within this strategy. Lawn Bowls is an elegant sport in which it is customary for players to wear whites, a flexible practice although it is always better to wear chic and comfortable clothes. It is up to you to provide your own “French touch” in this very British sport to say the least! However, attention, as flat shoes are the done thing! Nestling in the heart of the Ardèche, you will ask yourself why and how the leading bowling green in France comes to be located in Largentière, at the Domaine Les Ranchisses campsite. Chance encounters, inquisitiveness and an ounce of daring are behind this, since by attending the European Lawn Bowls Championships during a trip to Jersey, Philippe and Véronique the campsite owners, fell under the spell of this sport and decided to take the plunge. Chic, elegant and of a matchless style, Lawn Bowls is quite naturally comfortable on the Les Ranchisses campsite! How do you play Lawn Bowls? Although comparisons can be drawn between pétanque, boule lyonnaise and lawn bowls, each sport has features which are unique to it. In a distinctive style, Lawn Bowls is played on a lawn or a carpet surface. The bowls differ from pétanque boules, in terms of their shape and weight. They have an unusual shape and an unequally distributed weight, which complicates the trajectories of the bowls, and requires of players both precision and strategy. After an intense game, come and cool down at the Guinguette des Ranchisses, the top location for relaxation where good humour is King. Perfect to spend a delightful moment amongst British elegance and French charm. and then follow signs for Alès via the D104. After Uzer follow signs for Largentière (on the D5). and follow signs for Rocher/Valgorge. The Les Ranchisses campsite is 2 kilometres away. Established in 1981, the Domaine Les Ranchisses campsite is run by Véronique and Philippe Chevalier, and offers camping and caravanning facilities and traditional hotel amenities, group reception events, hire of gîtes throughout the year, and also has a well being and fitness centre.